It’s often hard to review second books in a series. World building is normally done in book one and plot resolution is yet to come. With no beginning or end, we have only middle, so how to judge? ‘Fuse’ has this problem in abundance. It adds little to book one, remains readable throughout, but leaves the reader only with more questions. That I feel so discomfited signals a degree of disappointment with the book. I really liked ‘Pure’. It is dark and dirty; a dystopian vision that works, that goes deeper than just another Hunger Games clone. ‘Fuse’ however ploughs the furrow left by Kantiss Everdeen. Pure explores some interesting areas, such as the role of technology in human advancement and the futility of hankering for a better time. The concept of being fused to your past was fascinating. Best of all ‘Pure’ wasn’t all about an oppressed group sticking it to their overlords. Which is exactly what ‘Fuse’ is. The fragmented heroes in this book are trying to destroy the Dome and bring down its leader, Ellery Willux. The book starts slowly. The bleak existence of those outside the Dome makes for heavy reading, but things do eventually get going. The narrative becomes exciting and there are some great set pieces, but I felt the story became a string of events, with characters arbitrarily being pushed in one direction or another. It’s plot development as practised by the writers of Lost. Too often characters would suddenly acquire significant pieces of information, important landmarks would not be guarded, characters who had been useless, suddenly acquired value. Worse still, Willux, the central villain becomes a caricature of himself. He’s like Mayor Prentice from Patrick Ness’s ‘Chaos Walking’ trilogy, with much subtlety and guile removed. Harsh words for a book that still has much going for it. I enjoyed reading many sections of ‘Fuse’ and it contains some beautiful characterisation. El Capitan and his conjoined brother form a heart wrenching symbiosis that elevates the book towards something special. There is also a gripping section inside the Dome itself, about which I can say little, other than it had me enthralled and frantically turning pages, desperate to find out what was going on. 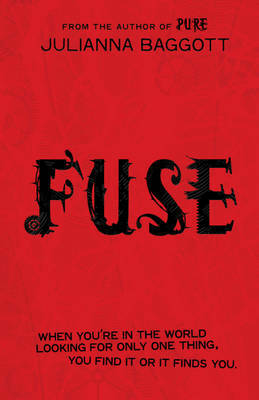 So ‘Fuse’ is a mixed bag; a classic middle-book-of-trilogy holding action. Always readable, occasionally moving but often contrived, it fails to build on the unique qualities of its predecessor. The book does however end with enough intriguing cliffhangers to keep you hooked for volume three. Proceed with caution.